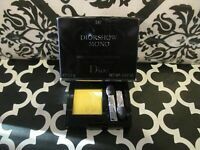 NIB Laura Geller I-Care Waterproof Eyeliner Full Size, Many Colors,You Pick $20! Ultra-pigmented and long-wearing, Maybelline EyeStudio Color Tattoo Eye Shadow gives you vibrant color that truly wows. With ink intensity and tattoo tenacity, the product can be worn alone or combined with other shadows to create a dramatic look. Innovative ink technology ensures a truly saturated look that won’t crease or fade. It is easy to apply with your finger or a makeup brush. Illuminate the eyes with a single sweep of the shadow or create a dramatic effect by adding multiple layers. The creamy formula also works beautifully as a primer when layering under powder shadows. The color will last all day and night. The product shown here is Bad To The Bronze, a shimmering neutral that is flattering on all skin tones. 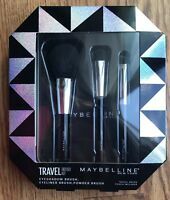 I wish Maybelline would wake up and bring this back as a regular item. Check any makeup review site & this is always a holy grail. Unfortunately, the shadow was limited-edition and is now very hard to find except on eBay. Packaged in a nice, heavy glass jar with screw-top lid. If you're familiar with the popular Paint Pots from MAC, this is very similar in coverage and texture. Light-skinned complexions will find it gives you a 'fresh' awake look. It helps to hide redness or capillaries. Used alone, you can create a fast, neutral eye-look. But it is a great base layer for more complex combinations of shadow. Keep jar tightly closed, otherwise the product will dry. I use it daily and LOVE it. Creasing hasn't been a problem for me, but if too much is applied, you may see a bit of that through the day. For those with extremely oily lids and everything creases for you, try using a primer underneath. (If you're on a budget, you have to try E.L.F. 's eye primer. I've used dozens of primers and IMO, for $1.00US, it is truly as good [or better] than eye primers selling for 20x as much). Overall I like it and can't wait to try all the colors soon. After hearing so many people talking about this product I had to buy. It truly lasts forever without creasing but wears off in spots well before 24 hours. I'd use this product as a base for powder eyeshadow more so then alone. Only strange thing is when using a kohl eyeliner pencil on top to line my eyes it removes the product and causes buildup on my eyelashes (easy fix use gel or liquid eyeliner). 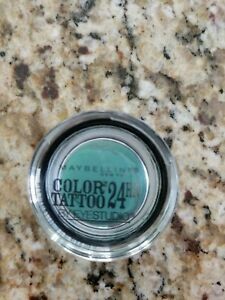 I really like using Maybelline EyeStudio Color Tattoo Eye Shadows. I purchased Gold Shimmer online instead of at the local dept. store. The color in the online stock photos show a lighter color than what ithe color pallette actually is. Instead of using the Gold Shimmer to highlight the eyes, I use it on the crease and outside corner of the lid. It's pretty but more of a golden brown than an actual gold. I would recommend. It's still a pretty color; just darker in color than expected. IN LOVE W THIS EYESHADOW! I have made it a personal mission to aquire every color of these eye shadows. They're perfect to apply a dash of color when in s hurry & can be applied w your fingertip(I prefer the ring finger bc it applies using less pressure, avoiding putting on too much) or w an eyeshadow brush. They are also waterproof, which comes in handy for a day at the beach or pool & wears excellent on oily lids as well. The selection of colors are beautiful. You really can't go wrong no matter your eye color! I love this shade.............makes my eyes look "open, uplifted" and warms up my face. I couldn't find it at the drug/beauty stores and so I went to Ebay........and there it was! Ebay, you and Maybeline made me happy.